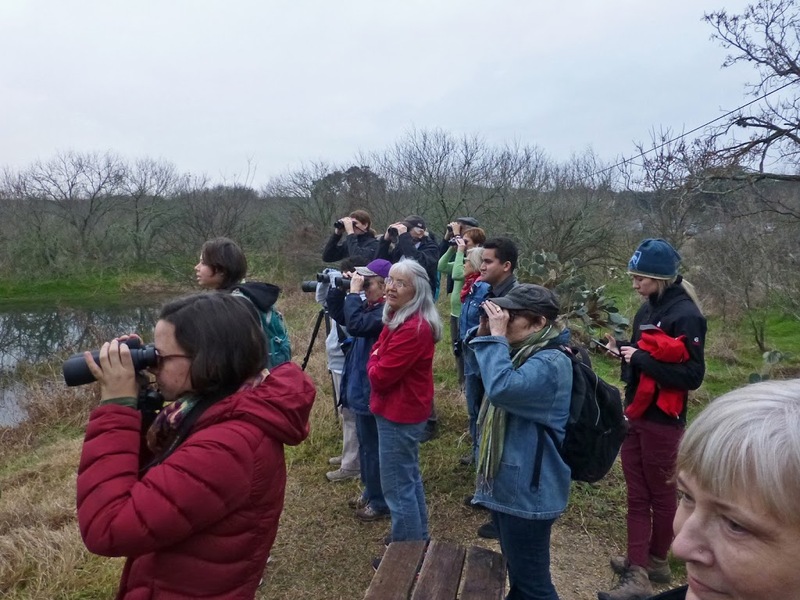 The new year is already resulting in great birding in the San Marcos natural areas. This time 27 different species were recorded including a Blue-headed Vireo, a Ladder-backed Woodpecker, an assortment of warblers, sparrows and 60 Black-bellied Whistling Ducks which make the top of our list. The early, drizzly start for 20 birders began with the birds calling. It took a few minutes for the first sighting and then it just cascaded into searching all the leafless trees. Loudest were the American Crows and best formation flying went to the Cedar Waxwings. Monthly birding walks are sponsored by the Greenbelt Alliance and led by Stephen Ramirez. This month he was ably assisted by Gabby Cole who also does a monthly bug walk. Each group has a Facebook page and are intended for area residents to get outdoors and enjoy the natural areas.